The most convenient, useful and right way for software engineers, UI designers, UI developers is to use UI patterns in the process of developing any application for computer devices. The User Interface (UI) patterns are standardized solutions for common design problems. ConceptDraw DIAGRAM diagramming and vector drawing software offers the ConceptDraw Solution Park with numerous solutions for wide variety fields. One of them is iPhone User Interface solution from the Software Development Area. 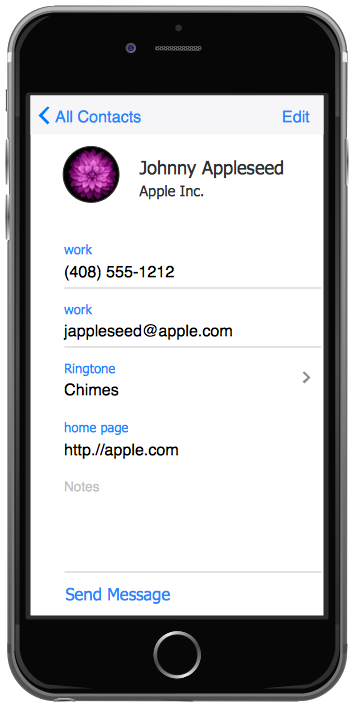 iPhone User Interface solution can help you illustrate the UI Patterns of any complexity for iPhone mobile device thanks to the predesigned libraries of vector objects and the set of templates and samples. 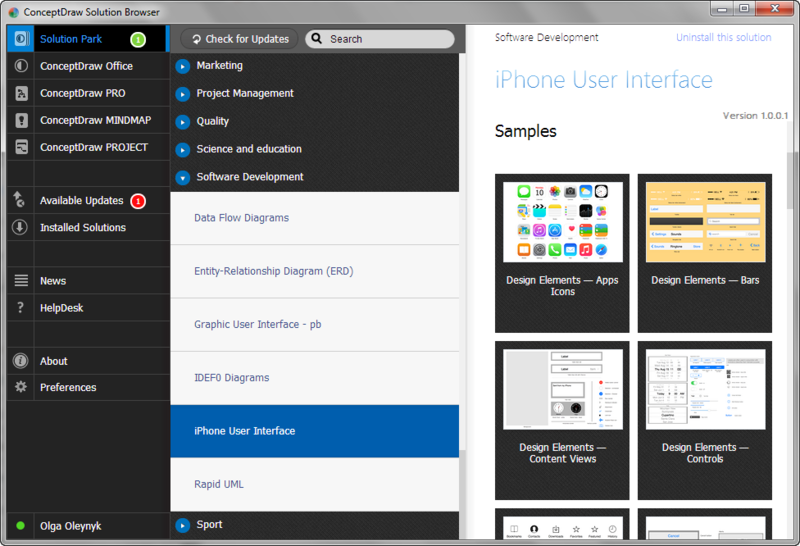 9 libraries of iPhone User Interface solution are available from the ConceptDraw DIAGRAM application, templates and samples can be opened for viewing and editing from ConceptDraw STORE. The iPhone illustrations with UI patterns designed in ConceptDraw DIAGRAM are professional looking and can be successfully used for prototyping and designing the user interfaces and applications for iPhone, for explaining and discussion various UI details in the team, in educational process, etc. All source documents are vector graphic documents. They are available for reviewing, modifying, or converting to a variety of formats (PDF file, MS PowerPoint, MS Visio, and many other graphic formats) from the ConceptDraw STORE. 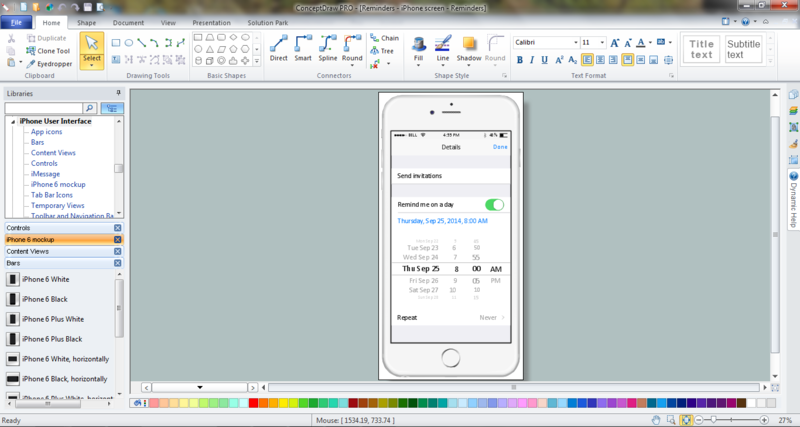 The iPhone User Interface Solution is available for all ConceptDraw DIAGRAM or later users. ConceptDraw DIAGRAM v12 is a powerful diagramming and vector drawing software. Extended with Website Wireframe solution from the Software Development area, ConceptDraw DIAGRAM v12 became the ideal software for prototype and design professional looking websites wireframes. Website Wireframe solution offers at your disposal wide variety of wireframe examples and samples which confirm this. The Microsoft Windows Azure platform is a highly flexible cloud-based solution with variety of services which supports not only the execution of .NET applications, but also allows developers to use programming languages like Java, PHP, Node.js, or Python. ConceptDraw DIAGRAM v12 diagramming and vector drawing software provides the Azure Architecture Solution from the Computer and Networks area of ConceptDraw Solution Park with a lot of useful tools which make easier: illustration of Windows Azure possibilities and features, describing Windows Azure Architecture, drawing Azure Architecture Diagrams, depicting Azure Cloud System Architecture, describing Azure management, Azure storage, documenting Azure services. Information technologies rapidly develope in the modern world. The popularity of electronic and mobile devices is growing every day and entails the need for the new applications. Now the quantity of applications is incredibly large and every day increases, and thus the programming for mobile devices, and particularly the iPhone programming, is increasingly demanded. iPhones are ones of the most worldwide popular smartphones developed by Apple Inc.
How To Draw an iPhone? It's very fast and easy to draw an iPhone and design iPhone user interface using the tools of ConceptDraw DIAGRAM v12 extended with iPhone User Interface Solution. iPhone User Interface Solution offers you the incredibly large quantity of predesigned objects that are grouped to 9 libraries: Apps Icons, Bars, Content Views, Controls, iMessage, iPhone 6 Mockup, Tab Bar Icons, Temporary Views, Toolbar and Navigation Bar Buttons. Picture: How To Draw an iPhone? ConceptDraw DIAGRAM v12 diagramming and vector drawing software extended with Cisco Network Diagrams Solution from the Computer and Networks Area is the best for creating Cisco Network Diagrams thanks to numerous predesigned Cisco network icons. All about prototyping. GUI Prototyping with ConceptDraw. Download prototyping software.